There is nothing quite like the taste of fresh, homemade bread. But actually making your own requires a lot of work, from mixing the ingredients to kneading it all out and perfecting it for the oven. They are a divisive appliance – many professional cooks and bakers declare they aren’t anywhere near as good as the real thing, but people who regularly make their own bread see them as complete game changers. Whether you want a bread machine which can give you the perfect crust, also prepare your pizza doughs and fruit bread, or just want a standard yet tasty white farmhouse, there is a bread making machine out there. Luckily for you, we have reviewed the best out there and narrowed them all down to a top 10. Panasonic is the king of the bread machine world. There are tonnes of models from them out there, but in terms of the best, we would have to say the high-end SD-ZB2512KXC takes the crown. There are a generous 33 programmes to choose from, which range from your basics through to rye and rustic sourdough and finish off at French, rustic fruit loaves and even compotes. A yeast dispenser drops the ingredient at the optimal moment to increase the taste and quality of the bread, which is a feature unique to Panasonic. There is also a raisin and nut dispenser which folds these in at the best time for an even distribution, which anyone who has tried by hand will know is not an easy feat. With each purchase, you get a book which has loads of recipes included. Perfect for any complete beginners or anyone wanting to get the best out of their machine and venture into the world of artisan baking, for instance. For anyone who loves a bit of jam on their fresh bread for breakfast, or maybe bakes a weekly Victoria Sponge, you can prepare your jam in this machine, too. Plus, there is the option to bake your actual cake in it too. It is one of the pricier models on the list, but for anyone who is serious about their home baking, we think it is worth paying that bit extra. Every result was outstanding, it is easy to use, incredibly reliable and feels well-built. Even though it is very similar to the later Panasonic SD-ZB2512KXC, we had to include this particular model for anyone out there who wants something a bit cheaper. You may not be bothered about having the most up-to-date model, but still want full reliability. You still have all of the settings which make the more expensive option shine, such as the yeast dropper and fruit and nut dispenser, the ability to choose how light or dark you want the bread, and jam and compote modes. The only big difference is the six fewer programmes, which are mainly the rustic and artisan breads. It is a very similar size and shape, and all of the components are the same materials and build quality, such as the metallic paddle. We liked the loud beeping at the end of the cycle to indicate it had finished, which seems to have been dimmed a bit with the later model. The reason it comes just below the SD-ZB2512KXC is that it seemed a slight bit more unreliable. You could really feel the few changes between the two models in the results, in terms of the taste and look of the bread. It still produced exceptionally well 99% of the time, but for the gluten-free and cake options, the more expensive model just pipped it to the post. In terms of comparing it to the other models on the list though, it is definitely deserving of the top two position – a big statement indeed. To say it is a bit cheaper, you don’t miss out on that much at all. And you can put that money towards some extra ingredients which will no doubt delight your taste buds. With a huge 60 programmes to choose from, you could be forgiven for thinking this is an overly-complicated machine for a home cook. However, it is easy to use and a lot more simple than it sounds. There is little work to do on your behalf; just pick the setting you want, and the temperature and timer are all computed automatically. Choosing the exact programme is also easy thanks to the ‘turn and confirm’ dial which just flicks through them all, rather than you standing there for ages pressing buttons and popping in numbers. They are all displayed on a clear to read LCD interface. You still have a lot of personalisation, though. There is a delay timer so you can choose when you want it to be ready, say as soon as you wake up in the morning, and you can even create your own recipes with a bit of guidance. It will add nuts, seeds and fruit to the dough at the best time by automatically opening the chute, so the end result is a perfectly even bake. We also loved the collapsible paddle, which falls before baking. Why is this important? Well, a lot of other bread makers will bake the loaf with this still upright so a slight dent or hole can appear in the base. The collapsible blade increases the likelihood of a flat base and makes more room for edible bread. Every result was consistent, as expected with an appliance from the Sage range. It may be on the expensive side, but if homemade bread is an integral part of your diet and you don’t want to waste time and resources with the production of mediocre loaves, then it is worth the money. It is one of the largest, but it looks so elegant that this is probably going to be a minor issue. Making bread has never been as easy, no matter how fancy and experimental you like to get. Definitely one for the artisan bread lovers as opposed to your standard white batch loaf, though. One of the most expensive on the list, but what you get fits into the price bracket. Firstly, we would say it is definitely near the top of the list for anyone who loves to experiment with flavours and settings and tends to stick with it until they’re fed up of the taste. Not only does it come with a generous 15 standard settings, but you have 5 empty slots to pre-save your own creations too. You can set the timings for each of the stages in the process, from kneading to baking and rising. So if you feel that the white bread produced just needs a few more minutes of kneading for a crumblier texture, you have the freedom to select just that. The kneader has been designed for easy removal from the bread, which seems to work well as there was no damage caused to the loaf and no bread remaining caught around the blades. We liked the additional round baking pan which came with the machine, which is perfect for sourdoughs and sweetbreads if you wish to keep to the usual shaping. The internal heating is all fan controlled, for extra evenness and a crisper crust. It is a little bit noisy, but not enough to completely stop you in your tracks and become unbearable. In terms of price, we think it is a bit steep for what you get. As technology moves on, you can get machines with twice as many settings and which perform just as well if not better. It could retail for around half the price in our opinion, but if it does appeal to you and you will use it regularly, then we are sure the cost will balance out after a while. The personal pre-set options are perfect for anyone who is very fussy about taste and has not yet found the dream bread making machine - if you’re willing to pay the premium. With a nice clean interface and easy to use buttons, this Tower option is good for anyone who likes to make larger sized breads and will be using their machine regularly. The buttons allow you to flick through all the settings quickly, from size to brownness and bread type. An illuminated light lets you know whether it is on or off. For a machine with a selling point of having a gluten-free setting, it doesn’t especially do this any better than other machines we reviewed but was reliable and gave good results. There is a viewing window which will please those who love to watch the magic unfold. It is easy to clean thanks to all of the non-stick elements, and the paddle comes out of the bread with ease, so there is little damage caused. One niggle is that the 2lb size of bread rises so much that it gets a bit stuck to the lid and collapsed. It would be a perfect size if the internal compartment could maybe be a bit bigger. Another is that the recipe book included is a bit poor, all in cup measurements and for the 1.5lb size. They also seem to be a bit off – definitely worth purchasing another and adapting it yourself. For a mid-range cost and easy to navigate machine, it fares very well and should keep you happy for many years to come if you can live without a nut dispenser/dozens of alternative bread types. 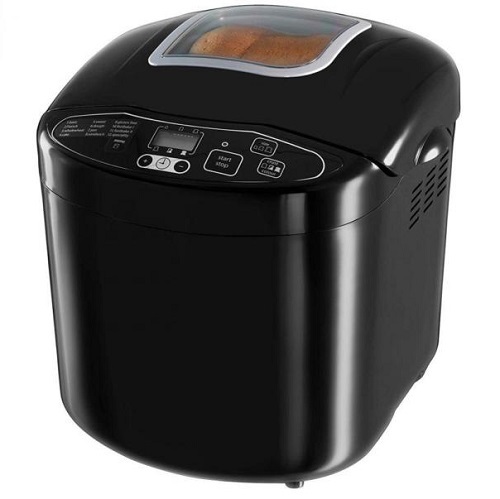 If the primary concern over your bread maker is the size, portability or storage capability of the machine, then this little Lakeland offering has you covered. It is the smallest of those we have reviewed by quite a bit which is great for anyone low on available space but who doesn’t want to go without gadgets. And even though it isn’t really a necessity, because it is small, the bread that is produced is the perfect size for an average toaster which makes a nice difference! The range of programmes included is really good and covers all the basics. You have knead-only rolls and pizza bases, as well as French, gluten free and extra crusty. There is a viewing window which takes away the temptation of opening the lid to check on the progress, and a delay timer so your bread can be as fresh as possible when you need it. As usual, the paddle does often stick in the bottom of the loaf, but it does come out quite easily. There is a later model available, but as you don’t get much more for the money, we still think this old favourite is the best. Because of the smaller size, it only makes one size of bread as opposed to the usual three. Therefore, it’s best for those who want a small loaf as opposed to a large one which will do a few goes, but there seems to be no signals in the build quality which would stop it being used every day. Live alone? Don’t eat much bread? This little Lakeland is ideal to bring out when you need it. Just about coming in as the cheapest pick, this Russell Hobbs 23620 is compact and perfect for those tight on space as well as budget. It performs well for the price, too. A 13-hour delay timer lets you get prepared and set everything up ready for when you need it, and the 55-minute fast bake option is among the fastest of those reviewed. We loved the fruitcake programme, which produced a great tasting, even bake. The jam was also great, even though it isn’t its primary function. You will have to add any fruit or seeds to the bake manually, but there will be an audible beep to let you know when this needs to be done. It comes about 22 minutes after the start of programme 1 (basic) and 5 (sweet), but 47 minutes after the start of 3 (whole wheat) as half an hour of preheating is needed. Although automatic additions are easier and less hassle, for the price, it is something we think anyone can live without. It is on the compact side, so best for couples and smaller families or anyone who loves to constantly churn bread out for optimum freshness. Even though the dimensions are small, it is still rather chunky, but it feels lightweight so you’d have little trouble moving it about or popping it away. Because of the internal size, we would recommend following instructions and recipes closely as there isn’t much give if the bread produced is too large for what it can handle. The paddle did get baked into the loaf every time we used the machine, but this is a common problem. It is also a bit on the louder side, but not enough to completely interrupt your day. For the price, we weren’t expecting a lot, but were pleasantly surprised. Definitely worth the money no matter whether you’re a baking newbie or a regular. Packed with enough extras and functions to keep you going, this Morphy Richards model is a budget pick but performs just as well as some of the higher end alternatives. The rapid bake function will prepare a loaf in around 80 minutes, which is good for those last-minute bakes before bed. There is also a delay timer function so you can set it to get to work overnight and lose no time over the preparation. There are five crust settings, which is two more than commonly included. Choose from very light, light, medium, dark and very dark to please your taste buds and get it just how you like. We liked the viewing window which will reduce the temptation to open the lid, and the keep cool walls which put safety first. There is also a cord storage function which will keep everything tidy when it isn’t in use, whether you are keeping it out on the worktops or popping it in the cupboards. It is a bit of a dated model now, which is made clear with the rather chunky and basic design and limited choice, but the fact that it is still popular and widely available shows its staying power and that it is very much quality over looks. We think it is a model which will please the traditional, old-school home cooks the best who are sceptical over the reliance on machines and gadgets. There are no fancy artisan bread functions or unnecessary additions, and no nut dispenser (good or bad depending on how elaborate your recipes are). It is just a simple machine with enough flexibility and give to get all of your tea cakes, ciabattas and malt loaves done too. The shape is a bit odd, but with an easy to use interface and plenty of manual control it is good for anyone who likes to do things their own way. For the price, this Morphy Richards bread machine offers the user 12 settings, three loaf sizes and three crust settings, which we think is pretty good going. One of the settings is a fastbake mode, which can produce a decent loaf in under 50 minutes. Perfect for those last-minute lunch ideas or if you forgot to get bread to go with your soup at dinner. There is also a time delay function which will last for 13 hours, in case you want to prepare it all before you go to bed but wake up to the smell of fresh bread in the morning. Or, why not try overnight baking to save you some time? You also have the option to prepare quite a few extras, such as bread rolls, pizza dough, cakes and jam, on top of the usual white batches and whole wheat. We loved the clear view window so we could keep an eye on the process. Even though there will probably be no need for you to stop the machine and alter anything, it is a fun addition and will make baking with the kids special as they can see the entire method from dough to plate. We liked the nice loud beep at the end to tell us that the cycle had finished. Bread is easiest to remove from a machine just after it is ready, so this is a helpful feature which we found lacked power on a lot of the others on the list. We will say that the recipe book seems to be catered for an American audience, with talk of skimmed milk powder and they also end up quite a bit sweeter than necessary. Finding some other faithful recipes or experimenting may be the best way. The fast bake was one of the most reliable and quickest - as the name would suggest. One of the best for anyone who likes to experiment as it seemed quite forgiving. Arguably one of the best-looking bread machines thanks to the soft-touch, digital interface, this Andrew James model serves well in design and functionality. Whether you are completely new to the bread machine world or would call yourself quite the expert, this machine will produce results you are happy with. The backlit LCD screen will let you know what setting you’ve chosen, and the time left to go so you can prepare for the big unveiling. The timer delay will let you set when the machine starts working, even if you are not in the house or awake at the time. There is a generous 15-hour possibility which gives you plenty of freedom. There is a commonly included jam setting, but there is also a more unique yoghurt making programme. Any additional ingredients, such as herbs and seeds, are added automatically, so there is no need to interrupt the cycle at any time manually. The machine picks the best time for the drop. We liked the handle of the lid being at the side as opposed to on the top which was easier to control, especially if you struggle with height. We also thought the range of programmes was great for the price – some other cheaper models miss varieties such as sourdough, sweet bread and even milky loaf. The paddle got stuck in the bread a few times, and the bottom of the loaf was slightly damaged in removing it, but this is a much more common problem than you’d expect so is something to work around rather than something that should put you off. Still worth the price. Sleek and modern in design, but the magic doesn’t stop there. The keep warm feature is brilliant for the true fresh baked bread and butter experience. The first thing to mention is that it is crucial to follow the instructions to get the best results, at least until you are confident with the way the machine works and know how best to adapt to taste. It can also take a while to get the right ingredient measurements. Too little water results in a dense consistency, but too much leaves it too airy. Too much yeast means an early rise and then a dip in shape. Every model will have slightly different timings, settings and results, so it is important to think about the bread you want to make and research thoroughly. Try to remove the bread from the machine almost immediately, to prevent it sticking as it cools and the crust hardening further with the excess heat. 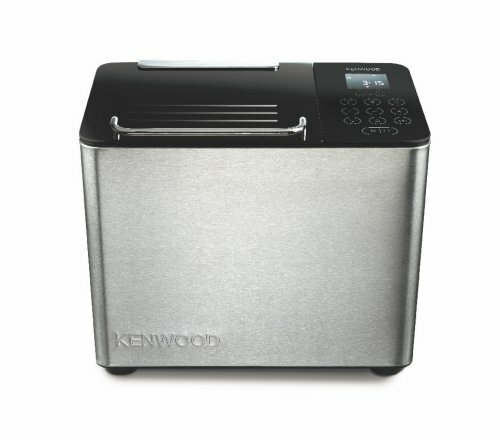 Bread machines start at around £50 and can increase to anywhere near £200. The higher-end models often have little extras which can make the process a bit easier, or more settings if you want to be adventurous. The cheaper models we reviewed, however, were still all great. The end result was always good for the price paid, and if something was not quite right it was usually a case of having to tweak the recipe as opposed to the fault of the machine! Unlike a lot of other appliances, lower-end and cheaper bread machines all seem reliable, so you don’t have to spend a lot of money to get a good result. Is Making Bread Cheaper Than Buying It? Buying the ingredients for your bread is usually seen as cheaper than buying the loaf ready-made, especially if you eat a lot of it. It will further work out as much cheaper to buy all of the ingredients separately than the ready-made flour packets you can purchase, but the mixes are a great way to get into bread making if you’re a beginner. The time spent making it may put you off – it is easier to run to the shops and buy it off the shelves – but will be worth it for the money saved. Is Homemade Bread Healthier Than Shop Bought? Packaged bread usually contains quite a few additives to keep it fresher for longer. It can last for around a week, whereas bread usually starts going stale after a day or two. Not only that but if you make your own bread, you can control the contents. You may find shop-bought bread a bit too sweet or salty, so the ability to craft your own and know what you are eating will have benefits for anyone trying to control their intake of certain foods. What Else Could I Make In A Bread Machine? We understand – before buying an expensive appliance, you want to know just how magical it is. Well, you aren’t just limited to white batch or farmhouse anymore. Different varieties such as sourdoughs, seeded and sweetbreads can usually be made too, either with pre-set functions or a bit of adapting on your part. A lot also have ‘dough’ settings which will stop the process before the baking, so you can pop rolls in the oven or make pizza doughs and pastries. Many also have settings for jams and cakes, which can be ready at the touch of a button. Who Makes The Best Bread Making Machines? Panasonic is the biggest name in terms of bread maker manufacturers. They were actually the first company to make a home bread maker, and their technology is seen to be some of the best. There are some rivals which have emerged in recent years, such as Morphy Richards and Russell Hobbs. Other names include Kenwood, Lakeland, Andrew James, Tower, Breville and Ambiano, as well as high-end models from Sage and Heston Blumenthal.